Joining in on the Instagram Challenge "March Meet the Maker"
joining in on instagram challenges fill me with equal parts excitement, enthusiasm and an overload of creative ideas. i also know that i will conk out approximately 10% of the way through. i lack commitment. however, there is one challenge i adore for its sense of community: joanne hawker’s march meet the maker which is a challenge to follow 31 prompts for each day of the month. by following the tag #marchmeetthemaker, we can travel across the world into the small shops, studios, craft rooms, spare bedrooms and corner desks of the most passionate creatives. the 31-day challenge is a big ask for people like me; thankfully joanne is a realist and encourages participation in any form. i lasted until day 6, then had a resurgence on day 13, but i decided that instead of regretting my lack of participation on instagram, i would instead think about the prompts in long form through the firain journal. my aim is to publish this article before the end of the challenge, day 31. update: i failed and it has instead been published on april 8 2019.
if after reading this article you have questions about any aspect of running a small shop, please do feel free to ask. it’s one of my favourite subjects to discuss! Although candle trends have moved on since Shakespeare’s day, we will always turn to our favourite candles when we need to spark some joy in our environment. Some candle scents are wonderfully uplifting and can be useful when we are working at a desk or whizzing around the kitchen cooking up a storm. Other scents are stuffed with relaxing properties that have a mysterious ability to promote slumber and cosiness. I have been meaning to write a guide to choosing candles for a long time, and after some prompting from a lovely friend and customer Liv (who herself found it hard to choose a scent! ), I have finally written the Firain Guide to Choosing a Candle! Chatting to my friend Huma of Our Story Time for a feature for the 91 Magazine blog was a dream come true! Huma has herself owned a lifestyle store, and wanted to delve into the inner workings of three small businesses at different stages of the journey. I was thrilled to answer Huma’s questions alongside two women I greatly admire: Emily Mathieson of Aerende and Tabara N’Diaye, shop owner of La Basketry. Here is the section of the article with my part of the interview. Do make sure you read the whole piece on the 91 Magazine blog and feel free to reach out to me if you have any questions about the nitty gritty of opening your own small shop! Rebecca at Ivy, Pip & Rose has created a beautiful autumn wreath that makes the most of the sensational colours, textures and scents available as the seasons shift. In this guide, she teaches us the art of crafting our own. A month ago, I walked up Cnicht mountain with my marathon-running husband and athletic friends visiting us from Thailand. For me, being out of shape at the moment, it felt more like a desperate scramble than a climb but it was one of those in-ya-face lessons about finding your own pace, your own footings, your own rhythm. It got me thinking about my values. Can you describe your pace, your pulse, the speed of your flow? 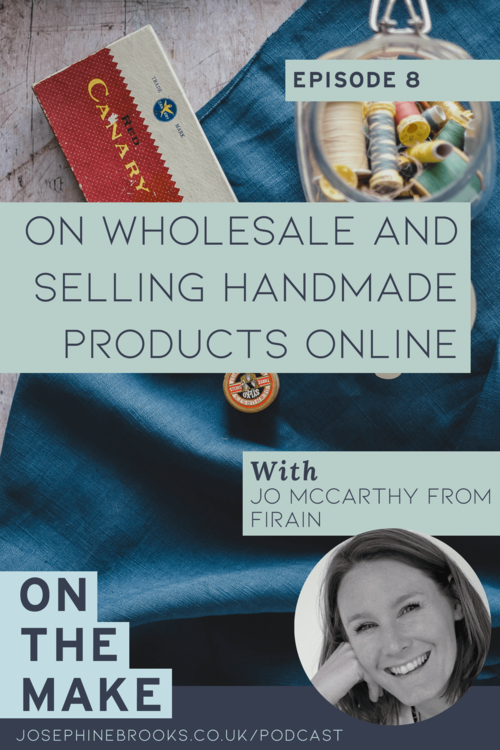 It was so much fun chatting about Firain with the lovely Josephine Brooks for her wonderful podcast ‘On The Make’. Click here to listen to me describing how I set up the shop and how much I love working with small makers. Josephine is a generous supporter and promoter of handmade, small businesses and craft and has a gorgeous, calming instagram feed @josephinepbrooks.